* I borrowed this idea from my creative friend Kati. We all know how much goes on behind the scenes of the holiday photo. Sometimes it's fun to see the discarded photos too. Scoop of Sunshine collects all types of quotes, articles and videos meant to make you smile, laugh, think and perhaps act. In the midst of harried shopping, crazy baking and family visiting, it is a good reminder to reflect on the bigger picture during this time of the year. Santa and Mrs. Claus are the big draw at Mecklenburg Shriners Club Holiday Party each year. There's no delayed gratification between telling Santa what you want and December 25. After you get your photo taken with Santa, you walk off the stage and choose your present right then and there. This year, Ben('s parents)chose a Harley Davidson jacket - photo soon to be released. If you are impressed with Ben's patience sitting on Santa's lap...about three seconds after the photo was shot, Ben had Santa's belt undone and off. He's that good. But as you can see, this Santa and all those involved in this wonderful organization have a good sense of humor and take it all in stride. It is easy for us to get caught up in our own issues, problems and complaints - I am just as guilty as the next person. If we can step outside ourselves once in awhile, we can see everything in its true perspective. Sometimes it takes a small gesture and sometimes a whack on the head. Lucky for me, this time I was given a hand. Ben received this ornament and letter this week. A lot of emotion washed over me as I read the beautiful letter. I know it is tiny print, but please read it. 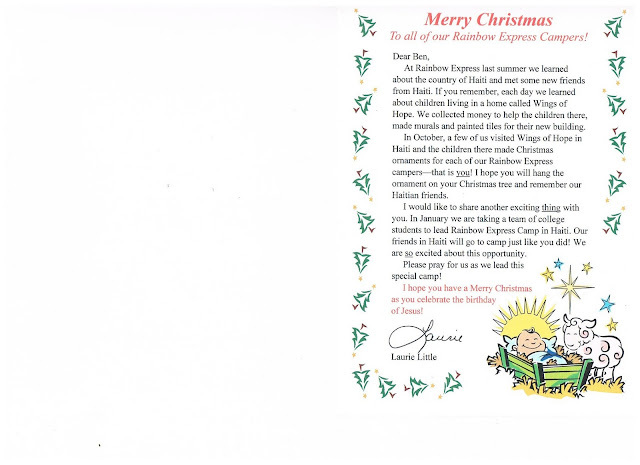 If you want more information, read their website: Wings of Hope, an orphanage for children with disabilities. Ben spreads the holiday cheer with unexpected hugs. Our traditions are a big part of our family life, from apple picking in the mountains to choosing a Christmas Tree from the same corner lot every year. These traditions are what the kids talk about when they look forward to the next year. This is what they will remember thirty years from now when they think back to time with our family. The people who are a part of these traditions are just as important as the tradition itself - our neighbors, friends and family join in the fun each year too. For countless years, we have invited neighbors over to build Graham Cracker Houses. We glue the crackers with edible Royal Icing (recipe below photos). We add an assortment of candy for decoration and voila, a beautiful table decoration and an on-going snack for the passerby is created. As the kids get older their participation and imagination have grown. This year was the best yet, with many doing most of the work on their own, leaving the adults to mingle, eat and drink. Our family typically designs one big house, but this year we tried something different, making a village of three houses, one for each boy to decorate. This turned out to be a better idea in concept - Sean's only interest was in eating the candy and Ben did not like the invasion of people in our home. I decorated Sean's house and Ben left the premises for his "secret" hideaway at the local coffee shop. Cover with wet paper towel so not to dry out. I often find myself wondering about the motions of life - I mean the motions we go through every single day, week, month, year and decade. In a class I taught recently, one of the seasoned married couples talked about how decades have gone by that they do not even remember. Although it is good to know that others feel the same way as me, it makes me want to savor the mundane and notice the little moments. Inside that blur could be the spectacular. The pizza took about 20 minutes to get to our table. Ben waited patiently without complaint. When the pizza came, he remained calm. Ben ate easily and well, moving his hand to his drink when he was thirsty. I can only explain the experience by saying, he was present and in the moment, more so than I have ever seen. In fact, I had the thought that people may be surprised when we stood to leave and he needed my assistance to walk. His behavior was so different - mature, aware and calm. I stop tonight to relish in this moment, to remember and cherish it. It will eventually be consumed by the blur of holiday festivities. Remember when I last wrote about the Rifton Blue Wave Toilet, we were waiting for a donated one from another family? Well it did arrive - almost new, really. And within a few weeks, it mysteriously broke. And Ben landed on the floor of our bathroom. I was sure he hurt something with the way he landed. Ben was clearly puzzled by the look on his face. After the dust settled and I was sure no bones were protruding from Ben's legs, I started to panic. I rely on this toileting system and without one, life becomes more difficult. A plan of action formed in my head and the next day, I contacted Rifton and told them the story - the whole story - including that this toilet was a donation. I explained that a small piece had cracked. I was hoping to purchase the small piece that broke. Well, of course, they cannot sell me just the little piece, I have to buy the whole thing. The customer service person asked me if I wanted her to work up a price. Yes, I did want her to work up a price, a small one, if possible. When the customer service representative at Rifton called back, it was to tell me that they were sending a new toilet system and would pay to have the old one shipped. I was elated. We are back in the saddle again, so to speak. And I firmly believe that when a company offers good service, we should pass it on...so please spread the word. This is an addendum to last night's post. In my enthusiasm to solve Ben's sleeping problem, I gave him all his medication at 4pm, including the sleep aid. And like I said in my last post, he was sound asleep by 8pm. At 1:30am, he was bright eyed and bushy tailed and remained so until I sent him to school on the bus. We try again today. I still have high hopes...just need to administer the medication according to schedule. A lesson learned every day. Today was the sleep consultation for Ben. I asked Ryan to go because he had information to add, but really I did not want to seem like a raving lunatic when I described Ben's sleep situation. I had nothing to worry about with this doctor - he made no assumptions, asked many questions and walked us through options for Ben. The doctor admitted that Ben's sleep pattern was unusual and offered many explanations and possibilities. He spent 45 minutes with us and probably would have spent more if the kids (and me) had not gotten antsy. 1. Sleeping pills have not been tested on children. It just has not been done. And they definitely have not been tested with children with special needs. I see a future in this area because so many parents deal with their child's insomnia on a regular basis and do not know what to do. 2. It is possible that when Ben was weaned off a seizure medicine called Clonazepam in May, we inadvertently, took him off the sleep aid he needed. Although Ben was using the medication to curtail break through seizures, Clonazepam is also a sleep aid and it may have been helping Ben get to sleep at night. 3. The doctor offered to do a sleep study with Ben, and he explained in detail what the procedure entails. Let's just say it involves a lot of electrodes on his face, near his mouth, legs and then 20 more on his head. Then an oxygen line is needed in his nose. I kept myself from laughing at the thought of Ben being contained with all those things attached to him. It would be more a study in the adult's reflexes than a study of Ben's sleep. 4. Melatonin, in a small dose, given early in the day, everyday, can be used to help set a sleep rhythm. We concluded the visit with the decision to give Ben the smallest dosage of Melatonin at 4pm, and then start him on his old dosage of Clonazepam. We will keep in touch with this doctor as well as Ben's regular neurologist. We may have to do a sleep study in the future, but we are going to see how this works first. I am glad to have a plan. I am even happier to find a doctor who seemed truly understanding of the situation and willing to try different methods to come up with a solution. I started this routine today and as I write this at 8pm, Ben is in his bed, asleep. Sean has been testing my patience recently. The final straw was when he yelled that Daddy was in charge, not Mommy. Unfortunately or fortunately, Daddy was not around to eat this declaration up. As I was getting the boys ready for bed, I pulled Sean aside and explained that his Daddy and I were sad about his behavior lately. I asked him what he thought we could do to change it. His instant response, "You can use a wand." I was pretty sure what he meant, but asked anyway. He said I could use a wand to change things, and as he glanced around the room, he said that he was certain that we had one around here somewhere. Sean's in bed now, and I am looking everywhere for that darn wand. Ben saw some kids at the park playing in a big pile of leaves. Ben wanted to be a part of it all. They let him join in and even brought over more leaves for him to enjoy. 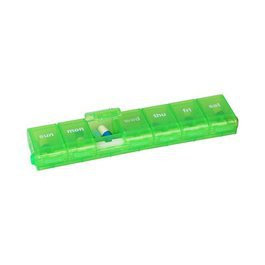 I just bought a new pill box, the one with the days of the week written on each small compartment. It has a button on either end - red to unlock the compartments and green to lock the compartments. As I was filling it and thinking about what a clever gadget it is, I stopped in my tracks and realized the reason I bought a new one was because Ben ripped open the other with his teeth. I just don't think the little button system will stop him from getting into this one. That will be a job for some engineer, making something Ben-proof. At my parent teacher conference, Ben's new teacher shared a story about him. There is a girl in the class who is in a wheelchair, has very little movement and is completely non-verbal. Since the first day in class, Ben has been interested in her. He reaches for her hand, holds it and makes her smile. 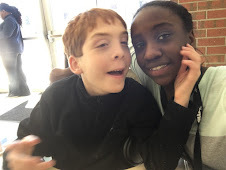 From what the teacher said, they have a bond; a friendship has formed. I know how special Ben is, about his ability to bring people together, but I was still struck by this story. The teacher spoke about Ben's compassion. Have I ever considered this emotion in Ben? Had I thought him capable? How sensitive and thoughtful is the teacher to see this unfolding in the class and describe it with such love and caring? Once again, Ben has taught me something new. It has been a tough couple of weeks - Ben, for some unknown reason, has not been sleeping. One night, he actually never slept. I mean, he never ever slept a wink. Not once. Other nights, it was not until 3 or 4am that he fell asleep. Some nights he woke at 1:30am and was up for the rest of the evening. On some of these nights, when I was at my wits end, I gave Ben a sleeping pill or Benadryll, a dose that would normally knock out an adult, let alone a 50lb kid. Alas they did nothing for him. One night, he spent the entire eight or more hours laughing hysterically while watching Bob the Builder movies. Between his cackling and my husband's bronchial coughing, I thought I might lose all sanity. I tried soothing music, laying down with him in my bed, his bed and on the couch. I gave sleeping meds sometimes and others not. When those ideas did not work, I turned on the TV, then thought it was too much stimulation and turned it off. I locked him in his chair, I kept him out. Nothing worked. At school, Ben was misbehaving, biting other students and refusing to do his work. For the first time, Ben came home with the Frowny Faces circled, rather than his usual Smiley Faces. To say frustration was becoming a part of my soul, is to put it mildly. I was beginning to fear the night because of what calamity it entailed. Worse than insomnia is forced awakeness. In my worst moments, I began to think that we would have to send Ben to a place at night that had paid staff that would be awake with him. Finally, I made a call to the doctor for a sleep study. We have a consultation appointment in December. But of course, Ben has slept soundly the last two nights. And he's happy and rested. He came home yesterday with a constant smile on his face and a great report from school. These photos are from yesterday...I could not help myself. One of our Grin Kid companions, Hayden is in a Halloween Costume Contest. The prize is an Ipad 2, that may help Hayden with his communication. 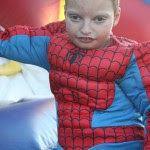 Please take a moment to vote for Hayden in his Spiderman costume - he is a few photos down on the list. And take a moment to read about Wolf-Hirschhorn Syndrome. In my other life, you know the one that does not involve making lunches, fighting with light sabers, watching Bob the Builder or anything else that defines my family life, I am trained in working with college students. As a result of working with this population, I became skilled as a leadership and teambuilding facilitator for groups, helping to build teams and increase communication. During this time, I met Tracy Moore, who did exactly what I did, but at a different university. We hit it off and started to plan teambuilding initiatives with a mission group going to Guatemala. This past January marked our 11th teambuilding retreat with this same organization. We decided to make our arrangement formal. After much banter back and forth, we came up with the name, AIM Charlotte. AIM represents our hope for the clients we work with and, more literally, Activities with Infanzon and Moore. Mission Accomplished - We help church groups going on mission trips to build a cohesive and trusting team before setting out on their journey. We designed a unique six-week course for couples who want to strengthen their marriage, build upon their relationship, and learn more about each other in a fun and low risk environment. Through similar dynamic activities that we use with groups, couples begin to understand their own communication styles and conflict strategies. We recognize the need to "stoke the fire", or maintain a team atmosphere with intentional group building activities. The Campfire Series may be adapted for the specific needs of any group from welcoming new colleagues, building trusting relationships or developing conflict management skills. In addition to these programs, we plan retreats, consult on group dynamics and leadership structure, or run brainstorming sessions. AIM can also customize a program based on the group's needs. To check us out, our website is http://www.aimcharlotte.org/. We have a Facebook Page and we are on Linked In too. Any help getting the word out is appreciated! I took Ben grocery shopping with me to WalMart. I had this brilliant idea to have Ben in his Convaid Stroller and attach bags to the back that I would fill with groceries. Then as the bags filled, I would bring them to customer service where my cart was waiting. By my third trip to customer service, I was tired of the process. It was a long walk pushing a wheelchair, carrying jugs of milk, only to return to the same section to get more heavy items. Just as I was ready to give up the fiasco, a WalMart staff person came over and offered to find another staff person to walk with us and push a cart to hold our groceries. Hallelujah! We take Star Wars seriously around here - Ben is a Clone, Logan is Obi-Wan Kenobi and Sean (not pictured) is Anakin Skywalker. Have a great time trick or treating! As if the Disney World vacation was not enough, the Kyle Busch Foundation gave Charlotte area Grin Kids' families tickets to the Dollar General 300 Race. Although Ryan had been twice to a race, the rest of our family were newbies. Ben loved the excitement and the noise, but eventually he was too excited to even sit. Ryan took him for a bite to eat and a stroll around the speedway while I stayed with the other boys who were mesmerized by the ecperience. When we caught up with eachother - I noticed Ryan taking money out of Ben's pockets. To my amazement, Ryan told me that two different and random people gave Ben money - totalling $25. Although we laughed, I am not sure how either one of us felt about it. A discussion for another day. We had a great time - it was truly an experience and I was glad to see what it was like. The noise was overwhelming, even with ear plugs. Unlike other sporting events, there's little cheering or yelling since nothing can be heard above the roar of the engines. Next time I go, I will get the ear phones that allow you to tune into the car you follow and listen in on the communication between the pit crew and driver. Seeing some of the other families from the Disney trip made it like a mini-reunion - probably the best part of the entire night. I usually do not get sick or have any type of ailments, but these last few months have proven otherwise. This summer I developed a cyst in an uncomfortable location and it got infected. Many doctor visits later, shots, needles, medication and Sean (yes, my three year old) holding my hand, I got through it. Now I am wearing a boot on my right foot. I have had pain in the arch for over a month, mostly at night. During the day I was fine, I even ran two 10k races during this period of time. The night pain was increasing along with my pill popping (just ibuprofen), so I finally saw the orthopaedic doctor. Unable to pinpoint what exactly is ailing me, they gave me a big boot to wear for three weeks and anti-inflammatory pills. What a way to end my 40th year! It would be unfair not to share the amazing things the Grin Kids staff had planned for us. If you plan to apply for this program and want to be surprised, do not read this post. It will be a spoiler. First, we pull into the airport departure section and a Grin Kid volunteer (just a good person who wants to help out) carries our bags. This means that neither Ryan nor I touched a bag once we got out of the minivan. We were able to focus on the 3 boys and getting checked in. Grin Kids supplied luggage tags for us, especially marked so they would make it directly to our hotel room. After security, which they did try to make it as easy as possible for everyone, we went to the concourse where we were welcomed by Police Officers, Santa Claus, Rufus from the Charlotte BobCats, Sir Purr from the Carolina Panthers and many other local and national mascots. Each one had goody bags to give out to every child. Our sendoff was marked by the airport fire department making a rainbow arch with their hoses spraying water over the plane. Once we were in the air, we were given lunch and drinks. Then they came around with a fruit basket. Then a candy basket. Then ice cream sandwiches for all. It was a kid's dream flight. Once we landed, we were able to get right into the special coach buses without entering the airport. Four motorcycle officers from the Sheriff's department gave us an almost non-stop ride to the Disney resort, stopping traffic, lights and anything else that got in our way. At the hotel, we were given packets and keys and told our luggage would arrive shortly. And this was only the first 5 hours of this vacation. Each day the staff had something special for us planned. Without giving every detail, here are a few of the special things planned just for our group - we met The Lion King cast, had premier seating at the Fireworks show in Epcot, and met and got autographs from Mickey, Minnie and Goofy. Each evening when we returned to the hotel, one bed would be completely full of stuff - t-shirts, gifts, toys, food and even bags to hold the loot. The Grin Kids website describes this trip as a "once in a lifetime vacation" and they are accurate in saying so. The connections the staff have made over the last twelve years to build this program and experience are so deep. It is obvious from the staff at US Airways to the people who welcomed us home in the airport and everyone in between, that the Grin Kids mission is one they fully support. They make everything as easy as possible for families traveling with a child with special needs and then add lots of sugar with many many cherries on top. It was their goal to make us all feel truly special, and I think we would all agree that they succeeded.